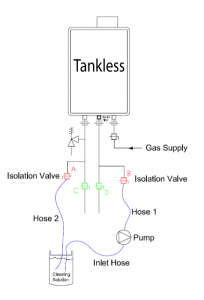 Flushing your tankless is essential to maintaining its high efficiency rating. A tankless flush will remove all of the scale and lime that has built up on your heat exchanger saving you money and helping the environment. Give us a call today to schedule your next service. Scale builds up fast inside a tankless as the water hardness of a certain area increases. Check out this chart of water hardness in cities around Southern Ontario and see how much your water heater is at risk for scale buildup. Having a clean tankless is the most important factor in keeping your tankless at its highest efficiency level. If you have had a tankless installed already by a reputable company you will have service valves, but if you paid a bargain basement price for your tankless the contractor probably omitted the valves to save money (they can still be added to the system after the fact). These valves isolate the heat exchanger allowing it to be flushed or cleaned of lime scale, calcium, and general buildup which acts as an insulator preventing the water from absorbing heat more readily. A tankless flush with a vinegar solution will dissolve the buildup effectively reviving the factory level of efficiency. We at Go Tankless only use food grade citric acid or food grade phosphorus acid to flush the inside of your tankless. This is a potable water system and if any contractor says they use a solution of CLR or some other highly acidic poisonous solution do not let them near your house! The last thing you want is to be introducing poisons to your drinking system. Our tankless flushing service covers most of Southern Ontario, give us a call and we can schedule a flush for your water heater. 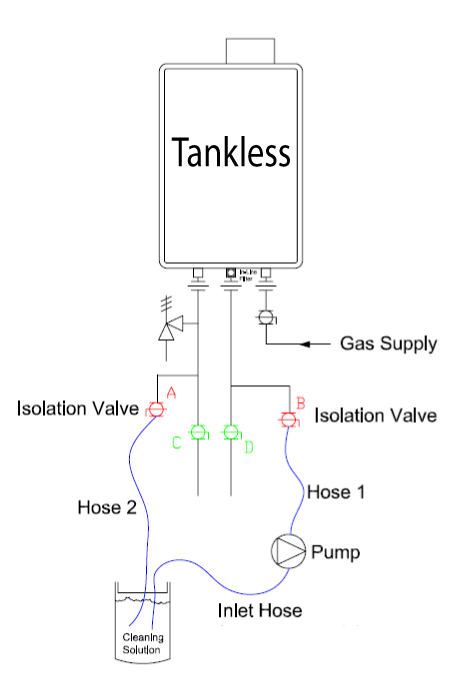 A tankless flushing is a quick process and only takes about an hour.